All-Star Weekend 2018 will be all about nostalgia. 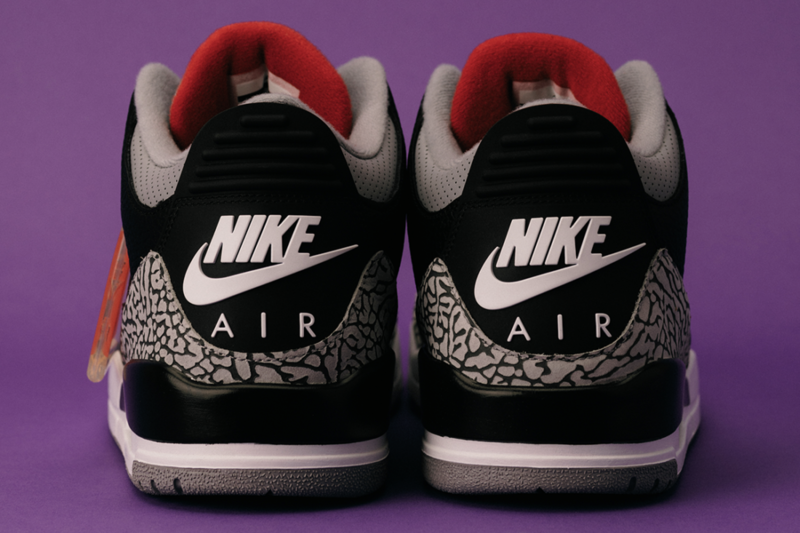 KD reuniting with Russ; LeBron reuniting with Kyrie; and Nike re-releasing one of its most beloved and iconic sneakers – the Air Jordan 3 Retro Black Cement. The release is just one in a congregation of Air Jordan 3s set to drop in the next two months. Others include: the Air Jordan 3 JTH Super Bowl (release 02.04): ; the Air Jordan 3 Clear Sole White Cement Slam Dunk (release: 02.14); the Air Jordan 3 Flyknit Retro Black (release: 03.18); and the Air Jordan 3 Tinker Hatfield Retro (release: 03.24). The timing of the Black Cement release, on February 17, benefits from a fortunate confluence of anniversaries. The 2018 All-Star Game marks the 30th Anniversary of the sneaker’s debut, having been first worn by Michael Jordan in the 1988 Slam Dunk Contest. February 17 also happens to be MJ’s birthday- the 55th anniversary of his debut…on earth. Since its inaugural appearance in 1988, the Air Jordan 3 “Black Cement” has been released 5 other times (in 1994, 2001, 2008, 2011, and now, 2018). The most notable difference between the 2011 and 2018 iterations is the heel tab insignia; this year’s release honors the 1988 edition by featuring the traditional Nike Air branding, whereas the 2011 version featured the famed ‘Jumpman’ logo. The 2018 model mirrors the 1988 original in nearly all other aesthetic dimensions- from the black cement colorway to the elephant print toe front. Fidelity to the mythic past has long been one of Jordan Brand’s greatest strengths- a capacity to tug at the heartstrings of that aging generation who still remember seeing MJ soar. By this standard, the Black Cement AJ3 has a potency most other sneakers lack. In his modernist masterpiece In Search of Lost Time, the French novelist Marcel Proust famously begins by describing the experience of biting into a madeleine – a kind of cake, which he used to eat as a child – and being overcome by a flood of nostalgia. The taste of the madeline instantly brings back memories of childhood, and the entire seven-volume novel that pours forth all springs from that one sensory trigger. To sneakerheads of a certain age, no memory is more powerful than that of watching MJ play. Adidas and Kanye may have the upper hand in style and technology. But when it comes to evocations of nostalgia, Nike and Jordan still have the market cornered. The Air Jordan 3 Black Cement, by recreating the details of the 1988 original , has the power to recall our fondest memories. The “Nike Air” embroidered on the heel tab is the sneakerhead’s madeline. The qualitative power of the Air Jordan 3 Black Cement is born out by its quantitative sales data- at least so far. Though the official release isn’t slated until February 17, a significant number have already hit the market via Nike’s SNKRS app, following the “Future of Flight” event on January 25th. Judging by the early numbers, the AJ3 is well on its way to becoming a hit – perhaps one of Beaverton’s biggest this year. 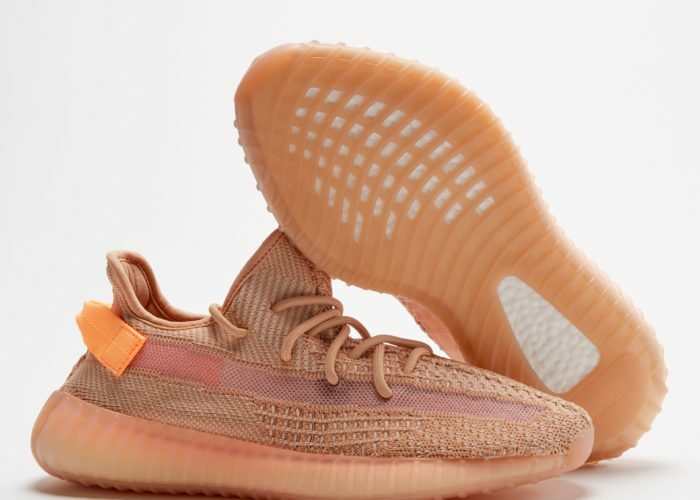 Already, they have accomplished what no other 2018 sneaker yet has- outselling the Blue Tint Yeezys on StockX, at least for one 24-hour stretch. On January 30th, the AJ3 Black Cement colorway topped the Blue Tint on our daily Scoreboard, ending a remarkable 45-day run by Kanye’s latest blockbuster. Since then, the two sneakers have been battling it out each day for first place. 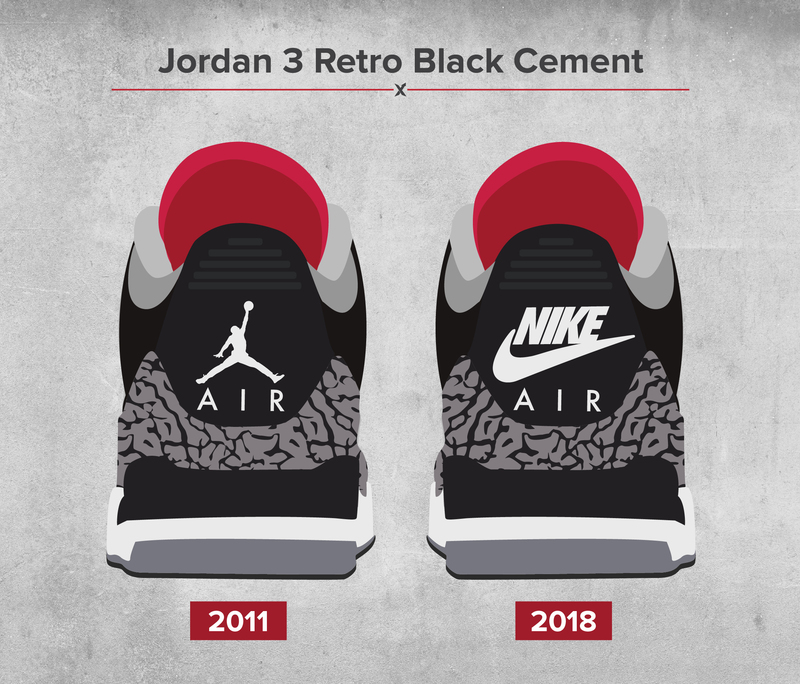 The following analysis compares the 2018 Jordans to the last two iterations of the “Cement” series- the 2011 Jordan 3 Retro Black Cement, and the 2013 Jordan 3 Retro White Cement. The above chart compares their market share, defined as a percentage of all Jordan 3 sales on StockX. 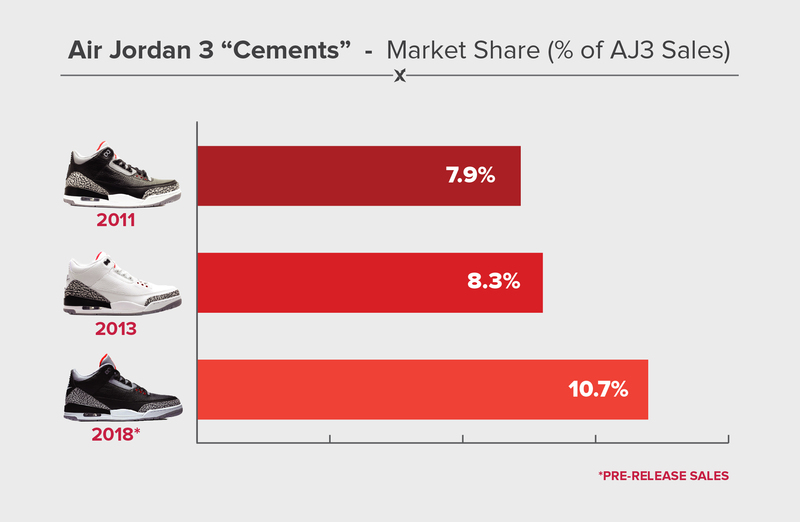 As you can see, the 2018 version – despite being more than a week away from its official release – has already exceeded the previous two models, accounting for 10.7% of Jordan 3 dollars spent. Over the past two years, the 2011 AJ3 Black Cement has sold for an average of $374, for a price premium of 134% over retail. The 2013 AJ3 White Cement has proven even more precious, selling for $478, or 139% over retail. Meanwhile, in the two weeks since it hit the market, the 2018 Air Jordan 3 Black Cement has sold for an average of $283, for a price premium of 42%. While illustrative when considering the 2011 and 2013 editions, a comparison of price premium is somewhat misleading for the 2018 version. 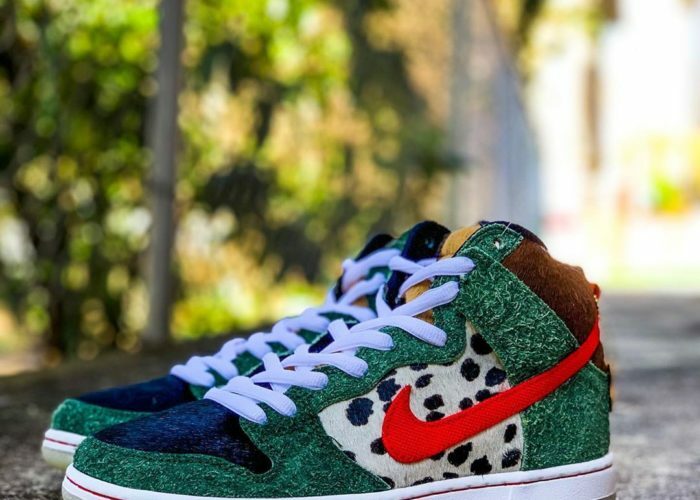 Sneakers that have been on the market for years tend to see their prices rise late in their lifecycles; as time passes, the overall supply of sneakers in deadstock condition declines, pushing prices steadily upwards. As such, the current market prices of the 2011 and 2013 AJ3 are inflated by their age. A more useful angle for analyzing 2018 AJ3 prices is the rate of decline for early sales. What you typically see, when a sneaker first hits the market, is a significant decline in average price, followed by eventual stabilization and leveling off. The pace and pitch of this decline is variable, and can be compared across models. 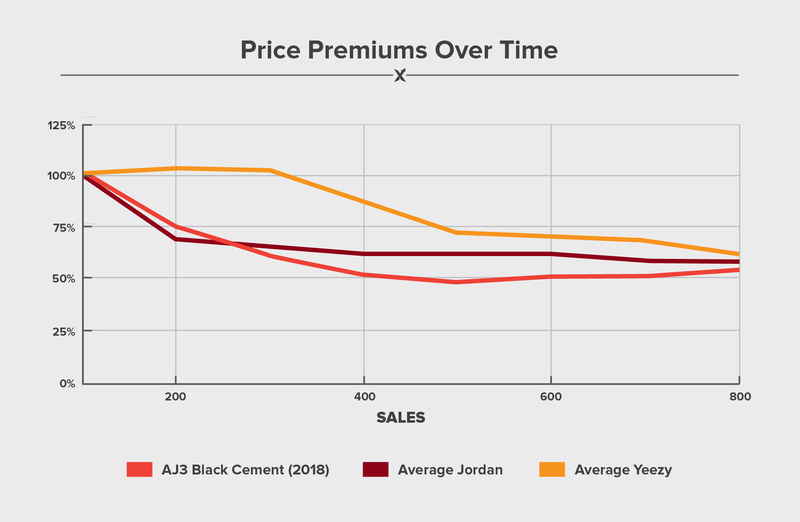 For this analysis, we looked at the average price of the Air Jordan 3 Black Cement over its first 800 sales, and compared it with the first 800 sales of other cohorts: the Top 5 most popular Yeezys, and the Top 5 most popular Jordans, from the past two years. As you can see, Yeezys, as a group, tend to have the most shallow and gradual price declines. Jordan price declines, on average, are steeper and more sudden. But for the Air Jordan 3 Black Cement, the trajectory is more extreme than either group. After 400 sales, the average Yeezy still sells for 88% of its starting price- that is, the price when it first hit the market. 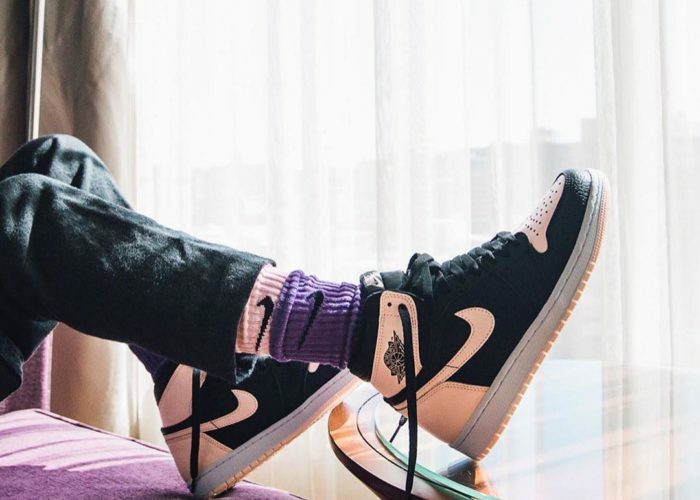 By contrast, the average Jordan, after 400 sales, is selling for just 62% of its starting price; and the average Black Cement is even lower, at 52% of its starting price. Over the next 400 sales, Yeezy prices continue to steadily erode, falling to 70% by their 600th sale and 62% by their 800th sale. 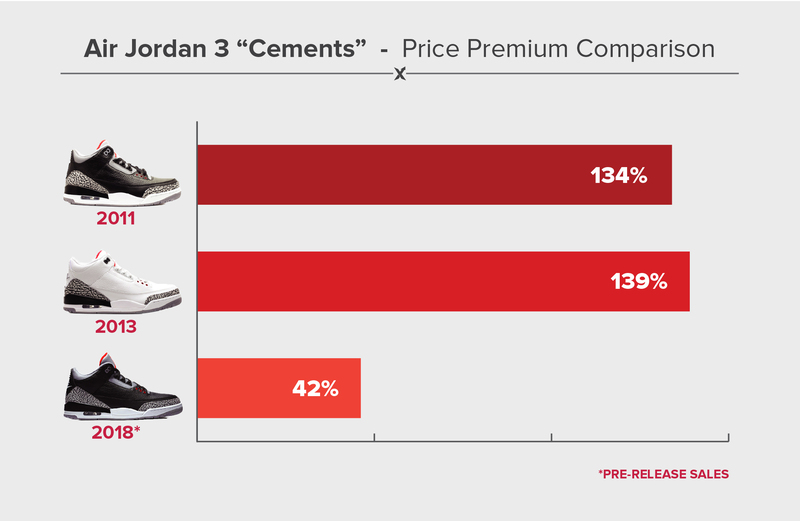 The price of Jordans, by contrast, remains relatively stable during this phase, dropping just four percentage points, from 62% to 58% of their starting value. The price of the AJ3 Black Cement, after falling to a low of 49% at their 500th sale, actually rebounded somewhat to 54% by their 800th sale. It is interesting how, after 800 sales, all three groups of sneakers end up in the same narrow range – selling for between 54% and 62% or their starting values. However, the trajectories of the quite different, with the Yeezy’s declining gradually, and the Jordans – particularly the Black Cement Jordan 3 – falling sharply in the first 400 sales. In the next few weeks, we’ll see just how successful the Black Cement Jordan 3 can be, as it enters into large-scale, general release after the All-Star Game. Will the power of Jordan nostalgia be enough to catapult it to the status of Yeezy-level blockbuster? Or will the faded memories of ’88 make this sneaker just another sentimental also-ran.